360° Virtual Reality Headset VR Goggles for iPhone Android Smartphones 4.5 to 6"
It’s easy to put your smart phone in it, and it’s convenient to operate and use. With this VR box, you can get a wonderful 3D experience. 1 x VR Box Remote. Compatible with Andoird smartphone, iPhone, TV Box, PC etc. Google Cardboard Headset 3D Virtual Reality VR Goggles for ANDROID iPHONE iOS UK. Turn your smartphone into an amazing Virtual Reality Headset with this complete DIY kit! Its soft nose pieces and light weight will give you comfortable 3D experience. You can get into a more realistic situation with its advanced active shutter technology. GL1800 3D glasses should work with DLP-LINK 3D projectors, then you can enjoy realistic, vivid 3D images. 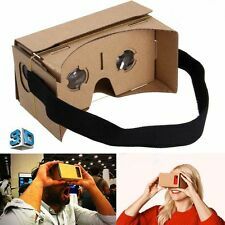 Google Cardboard Headset 3D Virtual Reality VR Goggles for ANDROID iPHONE iOS UK. 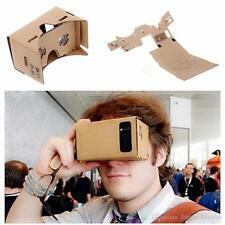 Turn your smartphone into an amazing Virtual Reality Headset with this complete DIY kit! - Google Nexus 4 and 5. 3D Glasses will work with most IOS, Android & Microsoft smartphones (with up to 5" in size) that are running Android 4.1 or later and have a built in Gyroscope. 5）Easy to use: get VR app installed in your cellphone, put it into VR headset, adjust and go. 8）Adjustable object distance 38-48mm, you can easily adjust the position of the spherical resin lens by moving the button on the top of the 3D VR glasses to get a better movie in seconds The experience is getting better and better. Witness the world of Full-HD 3D with active shutter 3D glasses. •3D Glasses, USB cable. Small but important print. It's very small and light, portable to use. Support the iOS system, Android system, PC system. Bluetooth 3.0, Long distances for use, up to 2-10m / 6.6-32.8feet long distances for use. 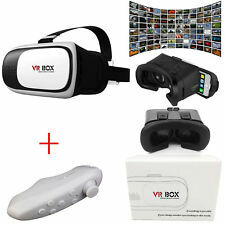 Virtual Reality 4.0 VR Box UKBuy Now. GL410 3D glasses should work with DLP-LINK 3D projectors, then you can enjoy realistic, vivid 3D images. 3D Glasses Type: Active shutter glasses. High transmittance LCD provide perfect 3D experience. 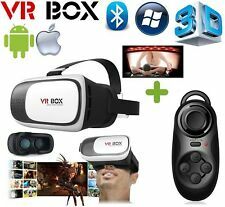 New listingVirtual Reality VR BOX 3D Glasses Gaming Headset. Umovers also 3D virtual reality VR Box V2.0 glasses headset. Easy to use, simply put your smartphone into the slot of the 3D glasses. No driver required, plug & play. (ie leave it in a shed, in the porch or the N/o of the neighbor you wish it left at. ). 1 x Gaming VR BOX. Lightweight Goggles. Foam Padding Around Eyepiece for face Comfort. Suitable for almost all kinds of smartphones Android / IOS. Better experience of movies. 2 Pairs Rechargeable 3D Glasses. Come boxed with charging cable, cleaning cloth and instructions. Dispatched with Royal Mail 2nd Class signed for. It’s easy to put your smart phone in it, and it’s convenient to operate and use. With this VR box, you can get a wonderful 3D experience. 1 x VR Box. Suitable for 4.7" - 6.0" phone, support iPhone 6 Plus. 1 x DLP Link 3D Glasses. 3D Glasses type: Active shutter. Display compatibility: DLP-LINK projectors. Relative Humidity: 20% - 80%. Battery Type: CR2025 Button Battery. We will be responsible for. 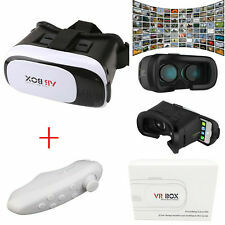 3D VR-Virtual Reality Headset 3D Glasses for 4-6" Screen Smartphones. You can also slightly adjust the position of the resin lens as show in the image above. for example iPhone's 6/7/8 Plus or Samsung Galaxy. Supports Bluetooth signal for LG / Sony / Panasonic / Sharp / Toshiba / Mitsubishi / Samsung 3DTV. Display compatibility: 3D TVs, 3D Blu-ray. Synchronous: Bluetooth V3.0. 1 x 3D Glasses. - Low-power self-detected function, low battery LED flashes to prompt the user when the battery is low. Features: 1. Low latency, low dizziness, 2. Cortex-A17 Quad-core, Mali-T764GPU, clocked at up to 1.6GHz 3. Support 3D, panoramic video 4. Built-in film source, can support online play 5.1920 * 1080 resolution, 5.5-inch TFT display 6. Built-in nine-axis gyroscope, can be sensitive to capture the body dynamics and direction 7. GL410 3D glasses should work with DLP-LINK 3D projectors, then you can enjoy realistic, vivid 3D images. Model Number: GL410. 1 GL410 3D glasses. Frequency: 120Hz. The 3D glasses will give you comfortable feeling with soft nose pieces and lightweight. Replacement 3D Glasses of Epson ELPGS03 3D Glasses Active 3D glasses replacement for Epson projector. Wireless 3D viewing allow you enjoy the realistic and vivid 3D images. Watch your favorite movies in 3D, communicate wirelessly with your 3D panel! 2 pcs Bluetooth Shutter 3D Glasses cleaning cloth. For all Samsung 3D TVs produced after 2011. Suitable for all 3D TVs and Projectors using bluetooth technology. This section active shutter Bluetooth glasses are also suitable for TCL (5390A series produced after October 12) V7300 (produced after November 2012). New Bluetooth 3D glasses compatible for TCL Toshiba 46L1305C, etc. for Panasonic WT50C Series DT50C Series Panasonic PDP Plasma TV VT50C Series ST50C Series UT50C Series XT50C Series New TV. The product includes a 3D VR GLASSES, which is specially designed for smart phones and can add great effect to the movie-going experience. It is perfectly suitable for students, white-collar worker or travelers, etc. 3D Glasses Type:Active shutter glasses. Supports Bluetooth signal for Sony Panasonic Sharp Samsung 3D TV. 5 x Bluetooth 3D Active Shutter Glasses. 120Hz refresh rate,ensures perfect visual quality and optimum 3D experience. 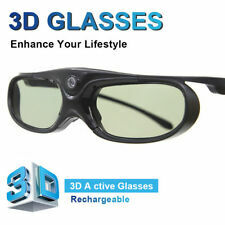 Bluetooth 3D active shutter glasses for viewing 3D images and 3D visions from Bluetooth-enabled 3D TV or Projectors. Work signal: Bluetooth. 1 3D Glasses. 1 User Manual(English). 88g / 3.1oz. Item weight: Approx. Bluetooth 3D active shutter glasses for viewing 3D images and 3D visions from Bluetooth-enabled 3D TV or Projectors. Work signal: Bluetooth. 1 3D Glasses. High-speed response liquid crystal lenses, prevent from eye strain. These glasses can also be used to view 3D print, magazines, comic books, TV, Anaglyph photos on the internet and publications. Use these 3D glasses to view movies like The Adventures of Shark Boy and Lava Girl in 3D, Shriek 3D, or Kids 3D. DLP|3D|Screen Mirroring. Projector Accessories. Type : Active Shutter 3D. Display Compatibility : DLP-Link 3D Projector. High responsive liquid crystal glasses lens, reduce eyestrain. Ceiling Mount Bracket. 1 X G300 VR Headset. This VR headset 3D glasses turns your smartphone into a virtual reality viewer. - Viewing angle: up to 105 ° (actually related to phone size and headband tightness). Perfectly suitable your face when you wear this Glasses Flexible and adjustable headband is suitable for different people. Features:Adjustable head straps: The headset is really comfortable with adjustable head straps and cushioned eyepieces so you can watch and play without distraction. Adjustable lenses: The lenses are also adjustable so you can position them to match your size of your phone screen. Headphone available: There is also a audio jack slot so you can plug your headphones in the side for the full VR experience.Comfortable Silica Gel . 1 X G300 VR Headset. This VR headset 3D glasses turns your smartphone into a virtual reality viewer. Perfectly suitable your face when you wear this Glasses Flexible and adjustable headband is suitable for different people. Features:VR Box 3D Virtual Reality Headset/Glasses Eye Travel for 4.5-5.5 inches SmartphoneCOMPATIBILITY - Compatible for ANDROID with 4.5-5.5 inches screen.FUNCTION - With this new and high tech gadget, you can turn your smartphone into a diverse reality viewer. You can experience immersive games, videos, 3D movies, photos and so much more unique stuff.OPTICAL LENS - The optical lens comes with reduced clarity to protect your eyes and to avoid dizziness for longer hours of use.SPECIAL FEATURES - Has foam covering around the area that accommodates the user's face for protection when in use. There are also adjustable straps to adjust pressure from the bridge of nose.Function:1.Camera button,open the camera then press the button2."Back"button,dif. Type : Active Shutter 3D. Display Compatibility : DLP-Link 3D Projector. High responsive liquid crystal glasses lens, reduce eyestrain. 1x 3D Glasses. Net Weight : 32g. Cool looking, super light-weight, comfortable for wearing. 120Hz refresh rate,ensures perfect visual quality and optimum 3D experience. 3D Glasses Type:Active shutter glasses. 1 x Bluetooth 3D Active Shutter Glasses. Supports Bluetooth signal for Sony Panasonic Sharp Samsung 3D TV. Automatic POWER OFF function: When 3D projector is powered off or not synchronized with 3D signal,3D glasses will be AUTO powered off after 30 seconds. Active shutter glasses. Under certain cases, the 3D active glasses may not work properly if there are any other 3D products or electronic devices are turned on near the glasses or TV.